If you live near the water or would like to add a water-inspired landscape to your yard, nautical decor may be a good choice. Nautical decor can included everything that encompasses marine life, shore life or a beach lifestyle. Nautical decor mixes nicely with decks and patios that overlook a lake, pond or ocean. Nautical design is casual and comfortable. It is meant to welcome guests and make them feel at home. Most homes with a deck or patio use this space to display any nautical decor that highlights their landscape. Tiki torches or solar lighting can be used to create a pathway up the stairs or to the deck area. Tropical plants, such as ferns or palms, are nice accents for a deck. String the deck with clear lights for night time fun. For the perimeter of the deck, create an irregular border to showcase your favorite perennials, such as bellflowers and hostas. Fill in with your favorite annuals in red, white and blue, using impatiens, petunias or geraniums. Hang nautical items on the deck fencing. Ideas include old oars, paddles, netting with faux lobster and crabs, buoys and metal stars. Use marine-life shaped garden stakes in your flower garden. Accent garden tables with shell candles and clear hurricane lamps filled with sand, painted coral, shells and succulent plants. If you live on the waterfront, landscape the area leading to the house or cottage. Use rope between wooden posts. Use rocks on the path to create direction for guests. Solar candles can provide a subtle glow on the path. Near a seaside dock or beach, set up a cabana with a table and chairs. Accent the perimeter with rocks and add decorative grasses for a seaside feel. 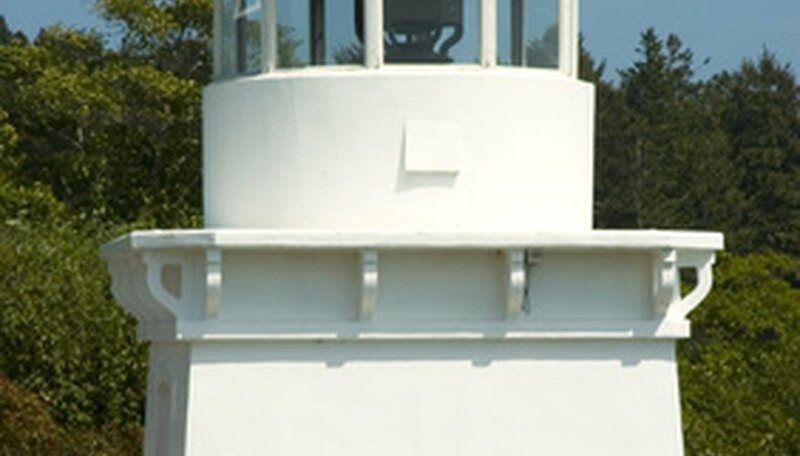 Use a garden statue, such as a lighthouse, as the focal point. Birdhouses and driftwood decor can also be used near the water. To display some of your favorite nautical designs, use a privacy fence as part of your landscape. It can become a background for antique nautical items, such as ship steering wheels, buoys, portholes, faux fish, fishing poles, oars and anchors. Create a garden space using rock or brick. Highlight it with shrubs like hydrangea, butterfly bush or variegated vinca. Accent with a mixture of spring bulbs, flowering annuals and perennials.